spot. 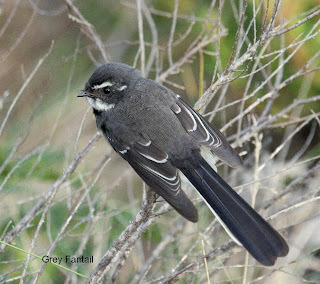 In the next half hour or so, I was visited by Yellow Throated and Black-headed Honeyeaters, Silvereyes, a calling male Satin Flycatcher, Grey Shrike-thrush, and a Golden Whistler. 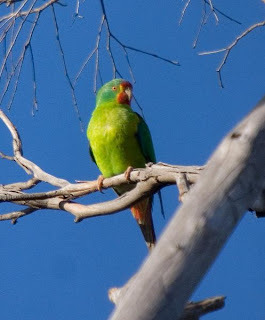 I briefly heard a Swift Parrot from one of the tall blue gums, a species I have suspected may breed here. The goshawk continued to visit the nest, which almost certainly contained young, always calling as it neared, and only the female. Where was the male? I soon found out. A pair of Grey Currawong approached and was vigorously attacked by the previously unseen male, which briefly perched on a dead limb across the valley, before, presumably, returning to his vantage spot overlooking the nest site. Perhaps this was why the female called when approaching the nest? Didn't want to be mistaken for an intruder! As the morning wore on, the area quietened down, and I reluctantly left, having had another rewarding day in the park. 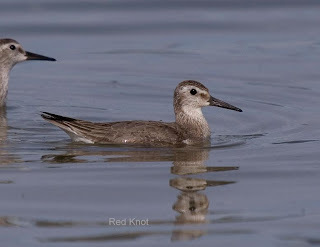 One of the few Latin bird names I remember is that of the Red Knot, Calidris canutus. It stems from my now distant childhood and the story of King Canute. As I recall, it was then suggested that his courtiers told him that he was so powerful that he could command the tide not to come in and he got very wet in the process--stupid git! Today, I see that the boot's on the other foot, so to speak. It's now suggested that he got wet to prove to his courtiers that he was not more powerful than God. For many years I thought that this event was immortalised in the Latin canutus referring to the Knot. 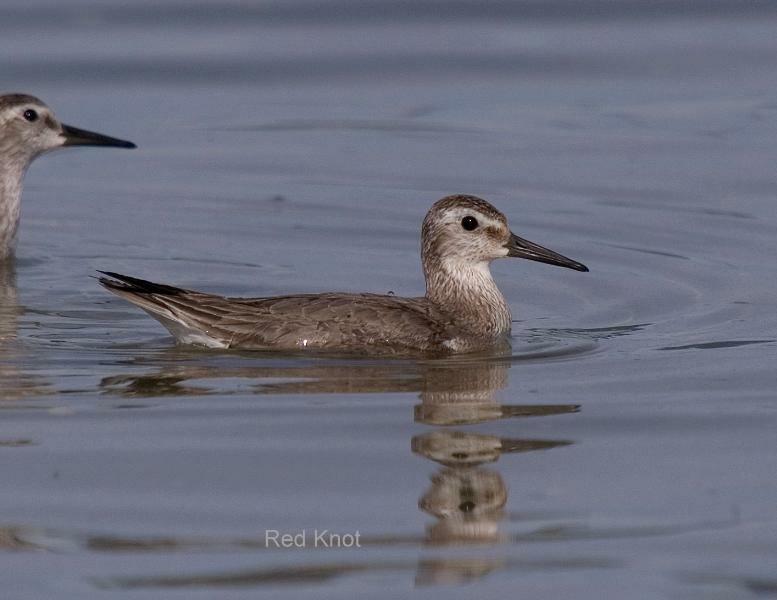 I fondly watched Knot feed on the tide line, and occasionally take to the water, reinforcing this thought. The truth is that the call of the Knot is written as "knut knut", which also happens to be the old Norse word for Canute. I think I prefer my version--another childhood story shattered. 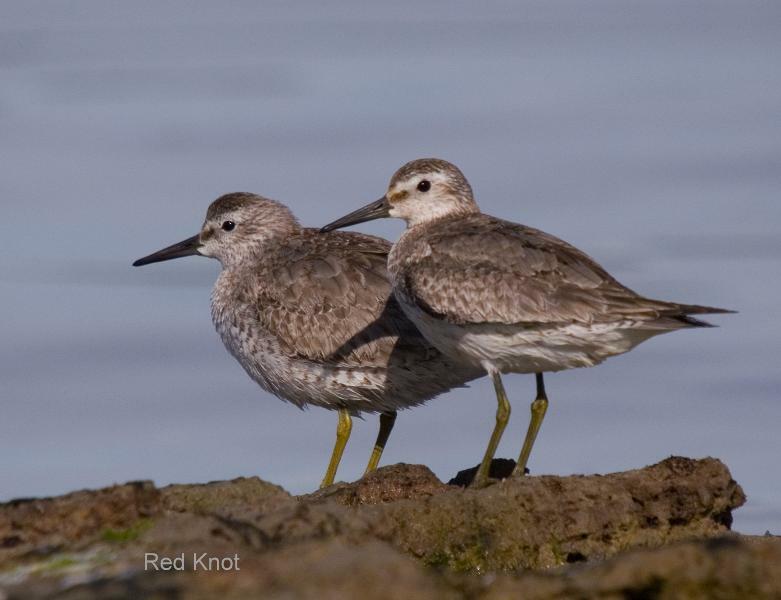 Recently the spit at Lauderdale, in Ralph's Bay, has been graced with the presence of first one, and more recently two, Red Knot. 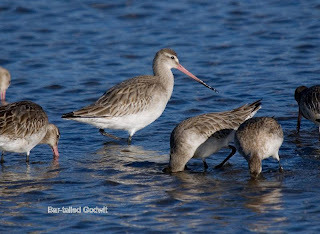 Not that uncommon in Tasmania, and often seen in the company of Bar-tailed Godwit, numbers in recent years suggest a decline. Surprisin gly tame, I took the opportunity to get numerous images, a few shown here, while looking for a mystery wader that was reported to be among the Red-necked Stint flock. One bird that I did see, as I parked my vehicle alongside of the nearby canal, was a sandpiper that I suspect was a Common Sandpiper--a decidedly uncommon sandpiper in Tasmania. 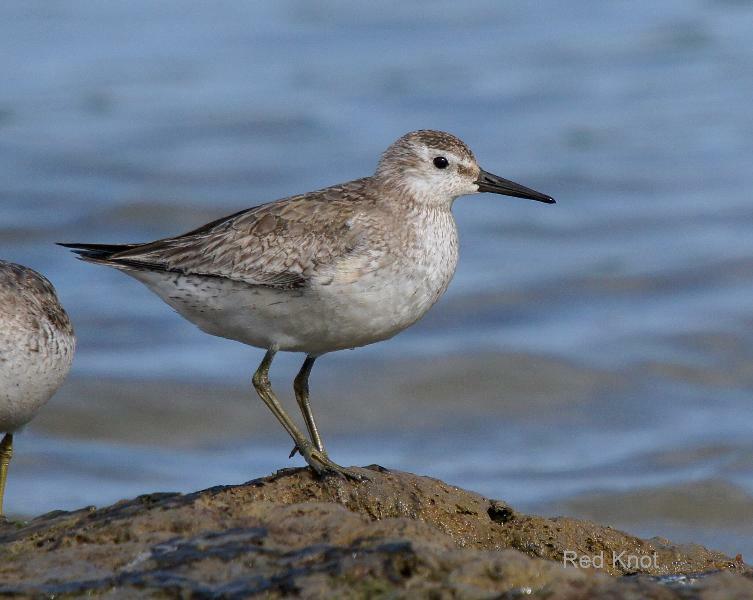 I did subsequently see 'the' reported Common Sandpiper at the mouth of the Clarence Plains Rivulet, across the bay from Lauderdale. While in the area, I visited the now full, Clear and Rushy Lagoons, observing a flock of 30+ Hardhead, another uncommon species in this state. 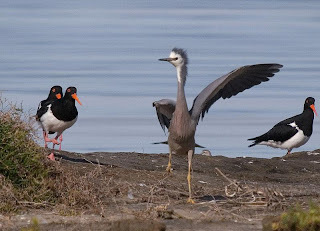 Perhaps mirroring the fight that locals (and many others) fought over the Ralph's Bay Conservation Area at Lauderdale, I witnessed the event, pictured at left, a few days ago. For many years a pair of Pied Oystercatchers have nested on the end of the Lauderdale Spit. Unfortunately for this resident pair, it's also a spot where many other birds choose to roost at the top of the tide. Mostly they have to contend with other oystercatchers, sometimes numbering a hundred or more, one of the largest roosts you'll find anywhere. But they also need to defend their territory against gulls, Silver, Kelp and Pacific, and, as you can see, the odd White-faced Heron. The pair of oystercatchers at left of the image, started on the oystercatchers that I had disturbed from further down this little peninsula, and once 'wound up', took on all-comers. This hapless heron, that had been fishing in the drainage ditch as the tide rose, lobbed down almost in front of them and immediately became the centre of their attention. Confused at first, it tried several times to find another spot to land, but these oystercatchers were determined that shouldn't happen! Amazing what determined locals can do when their 'space' is threatened! En route to Orielton Lagoon for a change of birding venue, I chanced upon a small flock of Cattle Egrets on the northern side of the lagoon. Totaling 9 in all, they were feeding among a small flock of sheep, fairly close to the road. A quick U-turn and I was alongside the paddock, which made the egrets understandably nervous. I scrambled a few shots out of the car window before they edged further up the paddock. 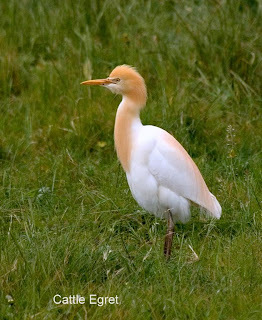 In recent years, no doubt due to the lack of rain, I've found few Cattle Egrets in southern Tasmania. So the recent prolonged rain may have caused these egrets to hang on longer than usual, before migrating back to the Mainland. The individual pictured at right is sporting almost? 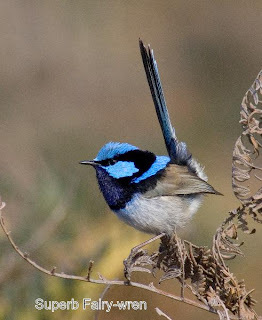 the full breeding plumage, the first that I can recall seeing in Tasmania. A few others in the flock had partial breeding plumage, but most exhibited none. As I drove the short distance to the bridge over Orielton Creek, a Little Egret flew over. Added to the 6 Crested Grebe I 'd seen from the Sorell Causeway, it made for an excellent start to my visit to the lagoon. More of that later. 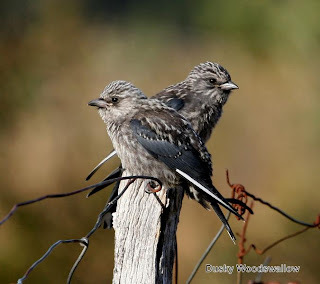 While looking for Striated Fieldwrens at Pipeclay Lagoon (I failed), I came across a pair of Striated Pardalotes with a nest hole in a low bank beneath an old fence line. Watching them from a distance, I realised that both birds had orange markings in their wings, rather than the usual yellow, one of which is shown at left. (You will need to click on the image to see this and you might like to compare it with the 'normal' type below). 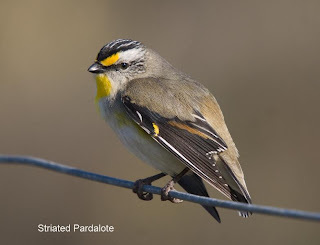 The Tasmanian striateds, were once known as 'Yellow-tipped Pardalotes', but are now lumped with their Mainland counterparts. 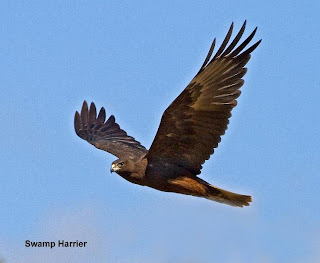 This species ranges over much of Australia, e xhibits variable plumages and the spot in the wing ranges from yellow to red (consult your field guide!). The one thing they apparently have in common is their "pick-it-up" call, and this pair incessantly demonstrated that. 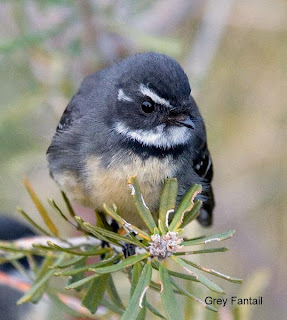 Most Tasmanian striateds migrate to the Mainland in the Autumn, returning early in Spring. Orange-tipped birds have been recorded in Tasmania from time to time, as has the red-tipped 'model', but this is the first that I've seen. I'm not sure whether this pair will breed successfully, as they have chosen a site potentially subject to flooding. 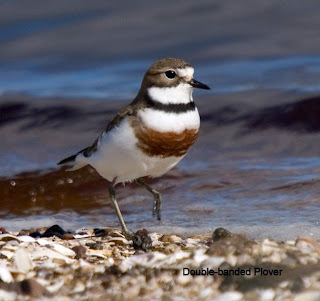 Much of the area is already inundated, sufficient to attract a pair of Black-fronted Plovers. I managed to fit about 20 minutes of birding at Gould's Lagoon last weekend, while on my way to a family get together at the Salmon Ponds. A little blustery, and overcast, but Gould's is almost always worth a look, and I even managed to add to my list for this location. 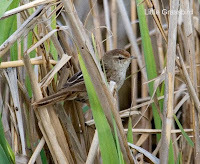 We parked on the side of the highway, crossing the road to cast our eyes over the reed beds, and saw the first of several Little Grassbirds, one carrying food, and I even managed a distant shot of one (below). A very 'nervous' Great Egret stalked the reeds beside the rail line, and we noted a number of paired male Australasian Shovelers involved in vigorous aerial chasing of unpaired males trying to "muscle" in. Along the shoreline towards the partly rebuilt bird hide, a pair of Chestnut Teal herded their clutch of recently hatched ducklings, although I suspect, some at least, may well end up as Harrier food, as a pair of Swamp Harriers were regularly hunting over the reed beds. Among the Coot and Teal, I found the first of two, possibly a pair, of Dusky Moorhens, my first for this venue. 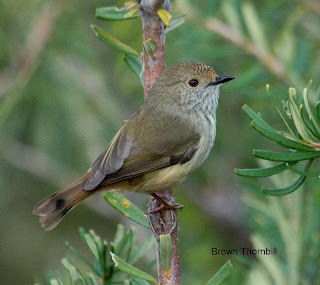 This species, common over much of Eastern Australia, is slowly but surely colonising Tasmania, so it will be interesting to see whether they breed here. Anxious family members, looking I thought, rather ostentatiously at their watches , finally pricked my conscience, and all too soon we moved on. All in all, a worthwhile 20 minutes. 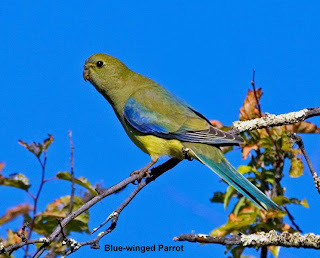 Just a short note to recount an all too brief encounter with Swift Parrots this morning. The first reasonable day for sometime, but still windy, I decided to bird the Mortimer Bay reserve. Little action at first, probably not helped by the temperature hovering around 8C, but as it warmed up, so did the birding. While trying to get close enough for a few shots of a Dusky Robin, I heard a single, rather metallic, sharp call. Although I felt sure I should know what was calling, I couldn't at first place it. 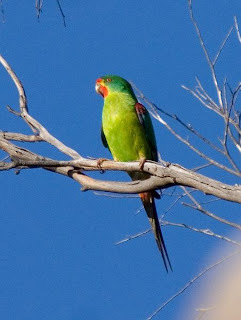 However as I neared what I thought was the source, the bird repeated it several times, and then gave the "giveaway" screech of a departing Swift Parrot--my first for the season. It wasn't a bird that I expected in this area as this parrot is more usually encountered on the western side of the Derwent River. It has bred here in the distant past, but that's was 30 years ago when the area was farmed. I followed in the general direction of the departing bird, which fortunately gave the same single note occasionally, enough to eventually find it. As you can see from the accompanying shots, it remained high in the dead branches of a eucalypt, not very conducive to great images. After a few minutes it took flight, at which time I realised there was in fact a pair. During the course of the mornings birding, I heard distant screeching from at least 3 pairs, but there may have been more. Perhaps they have been drawn here by the lack of Blue Gum flowering so far locally, and the fairly profuse flowering at "Mortimer" of the local peppermints. So if you haven't found any of the returning "swifties" yet, it's time to get out there! An ongoing illness and the wettest weather for many years, has kept my birding to a minimum. I've also chosen "soft" areas to bird, when I have managed to get out--those that require less walking, and some that don't even require me to get out of my vehicle! Ralph's Bay at Lauderdale is one of former, but it can be one of the best. 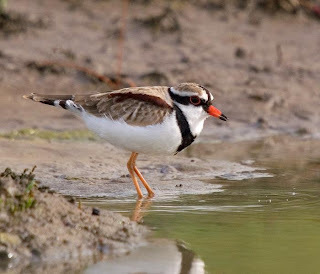 So on a driveby, ten days ago, I noted several Double-banded Plovers, most resplendent in their summer plumage, and worth an attempt at photography. 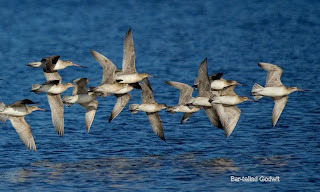 They were in a mixed flock with about 20 Red-capped Plovers , all feeding on the edge of a retreating tide. Both these species are surprisingly tame, but in a flock they are rather more inclined to fly, and they did, albeit only a short distance. However, I had "help" at hand. An elderly gentleman decided to walk along the beach, through the flock, much to my annoyance. But, It did enable me to take the shot at top left, as those of the flock that didn't fly, ran along the beach towards me, taking flight only when they realised they were caught in a pincer movement! 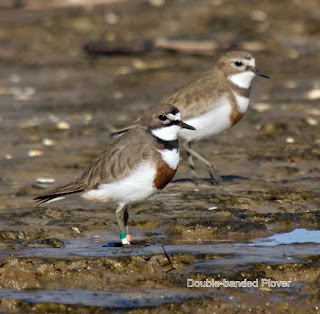 Among the flock I noticed a banded Double-banded, and on closer inspection, realised that it was "double banded", colour banded that is. I stalked it and scrambled a few shots, one at left. An enquiry as to where it was banded, brought a swift reply, (although there appeared to be some confusion). 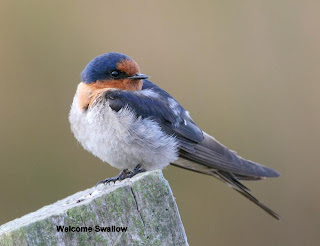 It appears most probable that it was banded in the Tasman River area of New Zealand--about mid South Island. So, last weekend, hoping to get better shots of the DBPs, before they head off for New Zealand, I returned to Lauderdale. A qu ick scan of the area revealed a total lack of DBPs, and only a handful of Red-caps. Undeterred, I wandered along the shoreline to a stony area they sometimes roost on, the tide fairly high and coming in. 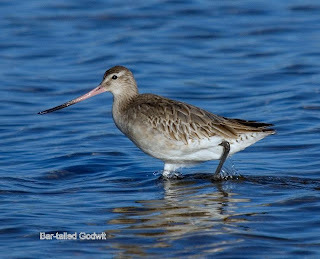 I had only taken a few steps when I was buzzed by a flock of Bar-tailed Godwit, wheeling rapidly across the bay. I walked away from the beach beyond the low vegetation and watched. After several circuits of the bay, they alighted less than a hundred metres away alongside the spit, in an area they often roost on, which I assumed they were about to do. So I was surprised that instea d they walked towards me, into the shallow water, and started feeding, coming ever closer as they did so. It's times like this that never cease to excite me. By standing quite still and just waiting, this flock of 23 birds, came within 20 metres or so, and continued feeding. Much of the time they would feed in a tight pack, all walking in the same direction, probing deep into the soft mud, sometimes immersing their heads to get at their unseen prey. I watched and photographed them for 20 minutes or so, before retreating and leaving them to continue feeding. So once again I had failed to get the sort of shots of DBPs that I'd hoped for, well there's always next year. However, it did occur to me that with all the gale force westerly winds we've had lately, that these plovers probably got to New Zealand a damn sight quicker than we ever could from Tasmania, having no direct link these days, and having to go via Melbourne, with all the security checks etc..... but don't start me on that one. Well suggesting that I was seeking is not strictly true. With the prolonged period of rain that SE Tasmania has had, and all the farm dams brimming over, I made a detour on the way home from birding Goat Bluff. My main interest was whether Clear Lagoon, an ephemeral shallow lagoon at Sandford, had any water in. It was full, the first time in many years. If this lagoon holds any water during the summer months, it often hosts good numbers of waders, especially Curlew Sandpipers and Red-necked Stint. This day it held a small number of Chestnut Teal, 2 Black Duck, a few Black Swans and a score of Kelp Gulls. 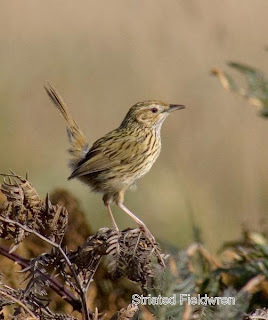 A short walk around the shore, produced about 20 or more Australasian Pipits and a few Eurasian Skylarks. I drove on to nearby Rushy Lagoon, a considerably larger lagoon, which also now held large areas of water. Here there were substantial numbers of Wood Duck and Chestnut Teal. 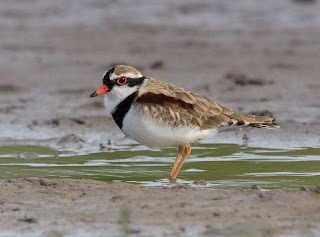 A squabble among some distant Black Swans drew my attention, and while watching them I noted a solitary Black-fronted Plover, a normally fairly common bird around waterway perimeters, but sadly lacking over the past several very dry years. It was while searching for more blackfronts, there were 4 in all, I noticed a small 'orange ball' around 300 metres away in the deep vegetation. 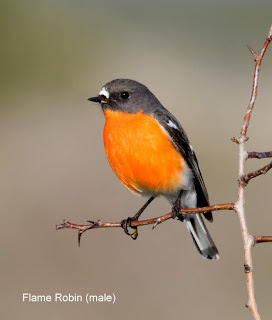 Although I couldn't be sure of the ID, I was fairly confident that it was a Flame Robin. Further scanning, produced 5 'orange balls', and a number of other 'plain brown' birds that as they worked their way in ragged line abreast towards me, were patently Flame Ro bins. I counted 17 birds at any one time, although I'm confident that the flock numbered around 25 or more, quite the biggest flock I've seen for over 20 years. I decided to attempt to photograph them, but realised that if I got out of my vehicle, they were unlikely to come anywhere near me. I parked along the fence line, reasoning that as they were spread out over a hundred metre wide band as they fed, I might just fluke a shot or two. A brief "dread" when many of them flew into nearby bushes, almost dashed my hopes, but they returned shortly after, and were now nearing me. I eventually scrambled shots of 3 individuals, 2 of them shown here, as they reached the fence line, before crossing the road into another paddock and were lost to my view in dead ground. After my recent post, I was heartened to find so many Flames. Whether they're normally here, or perhaps the recent weather played a part, I don't know. But I will be making more detours in the next few months! 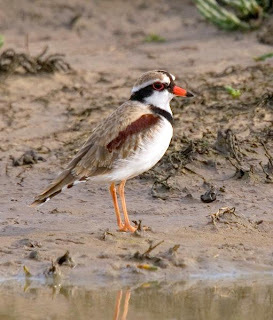 Perhaps the recent rain is responsible for the 'spat' of nesting Masked Plover. I noted 3 pairs with eggs in the Sandford area, a fairly early start. 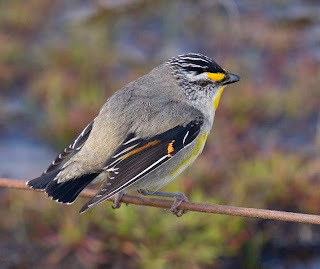 Out birding at Mortimer Bay recently, with a long time friend, and during the wide ranging discussions, I mentioned that I had an observation and question about Crescent Honeyeaters. Well we must have had some telepathic thought process going, as he started the answer without hearing my question! Perhaps I had broached the subject before, but it was in regard to Crescent Honeyeaters breeding, and apparently something that had been mooted during the first Bird Atlas in the early '80s. On the Eastern Shore of the River Derwent, Crescents are visitors during the cooler months, and commonly seen at that time in gardens and the surrounding bushland. In the main they're abs ent here in the Summer months, except in a few isolated areas of wetter forest, such as parts of the Meehan Range. However, during last Spring, I had photographed a very juvenile male Crescent (lower left) on Rosny Hill in early September, certainly not a typical area for Crescents to breed. I also recall photographing an apparent pair of this species on Bellerive Bluff a few days earlier, at a spot that they were frequently returning to. Closer examination of those images showed that they were carrying bills full of flying insects, as in the shot of a male at top left. Why I didn't 'twig' that they could be breeding there, I'm not sure, but I probably dismissed it as being outside their normal breeding range. One of the shots (at right) clearly shows a bird carrying a faecal sac-- an 'envelope' containing the faeces of a nestling--a clincher that the pair were breeding close by, possibly among the sheoaks clinging tenuously to the cliff face. So it appears that a few of the local Crescent Honeyeaters breed here, before both parents and young move (separately) away into the 'normal' Summer quarters. 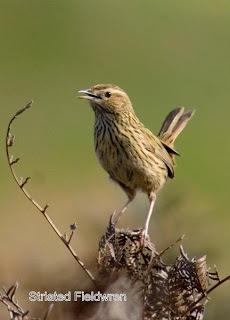 The question then arises, do they subsequently breed in their normal range and is this a relatively new phenomena, or has it just been overlooked previously. 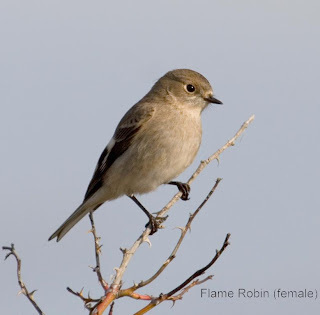 When you've been around birding for a while, it's easy to fall into the trap of believing you can interpret what birds are doing. The reality of course, is that at best you can make an informed guess, with the benefit of experience. So when watching the local Silver Gulls along the nearby waterfront going through violent gyrations, (without giving it much thought), I assumed this was part of a display. It was only when I decided to try to photograph them 'performing'--a difficult task at best--I realised this was far from the truth. In fact, it did take a lot of shots and careful examination of the images, to discover what they were up to. They were chasing and catching European Wasps. I should probably have realised this earlier, as I had "accidentally" photographed a gull that enlargement showed was chasing a wasp, at a nearby beach last Summer. But I had dismissed this as a one-off, isolated ev ent. I guess that few birders spend much time closely watching the all too common Silver Gulls, but perhaps we shouldn't dismiss them so quickly. Having 'discovered' what they were up to, I went back and watched their modus operandi. They,(there was up to 10 birds at a time), sat along the waterline, looking towards the sun, thus giving themselves the best chance of seeing the wasps silhouetted against the sky. 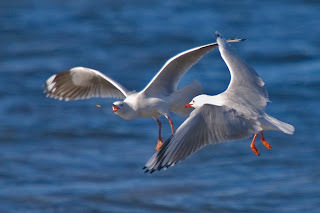 Having spotted one, one or more of the gulls would give chase, sometimes, as in the lower image, squabbling over a single insect. What surprised me was the obviously large numbers of wasps involved, but also that the gulls would bother with such small prey sometimes requiring considerable expenditure of energy to catch. Ah well, perhaps it just gave them something to do while waiting to share in the lunch of people parked at the nearby scenic lookout. The Silver Gull joins a list of local species that, thankfully, target European Wasps. 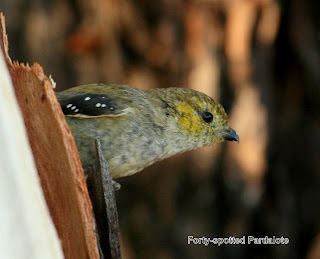 They include Yellow and Little Wattlebirds, Noisy Miners and Grey Shrike-thrush. May they have great success! You may need to enlarge the images by clicking on them, to see the wasps.